Nice passenger and car ferry ticket prices, timetables, ticket reservations and information for ferries sailing from Nice to Ajaccio, Bastia, Calvi and Ile Rousse. Compare all available Nice ferry ticket prices in real time and book the cheapest available Nice car and passenger ferry tickets sailing to and from Nice, Ajaccio, Bastia, Calvi and Ile Rousse with Corsica Ferries or SNCM ferries online with instant confirmation. 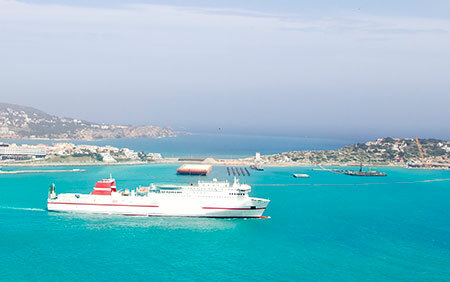 Book Nice Ferry Tickets with Corsica Ferries or SNCM for ferries sailing from Nice to Ajaccio, Bastia, Calvi and Ile Rousse online in advance to enjoy the cheapest available ferry ticket price. The price you see is the price you pay. There are no hidden extras or surprises such as added fuel surcharges or booking fees and we do not charge you anything extra for paying with a Visa Electron card. The price we quote you for your selected Nice passenger or car ferry ticket, onboard accommodation and vehicle type is all you will pay, and that's a promise. To obtain a Nice ferry ticket price and book your ferry ticket securely online please use the real time ferry booking form on the left. You are also able to add a hotel at your destination, or anywhere else, to your ferry ticket when completing your ferry ticket reservation. Nice is located on the French Riviera in Provence-Alpes-Côte d'Azur. Blessed by a sunny, temperate climate, Nice attracts visitors from around the world. Among its many attractions are its beautiful beaches, lovely seaside promenade, interesting museums, famous city landmarks and other tourist attractions. Nice, the capital of the Côte d'Azur is a truly cosmopolitan tourist destination. This part of the glorious French Riviera is the perfect resort for sun lovers, with many people choosing to relax along Nice's spectacular coastline during the sunny summer months and mild winters, where you are able to sunbathe, paddle in the azure sea, swim, waterski, parascend, jet-ski, or simply sip a smooth cocktail. Many visitors staying in Nice enjoy a stroll along the Promenade des Anglais (Promenade of the English), which dates back almost 200 years and lines the city's Mediterranean coast at the Baie des Anges (Bay of Angels). Central to life within Nice, this legendary boulevard is better known as simply the 'Promenade' and stretches for around 6 km / 4 miles, featuring many bright blue chairs where you can sit, relax and enjoy superb sea views. Tourists visiting Nice will find plenty of sightseeing opportunities all around the city. Many of these are historic and date from the 17th century, such as the magnificent Palais Lascaris, the Cathédrale de Sainte Réparate and the buildings of the Monastère Notre Dame de Cimiez. However, for many visitors, the legendary coastline is Nice's main tourist drawcard and in particular the polished pebbles of Neptune Beach are simply unmissable, along with its sun loungers, pedalos and children's play areas. Also of interest for tourists in Nice, look out for the Basilique Notre Dame, the Cathedrale Orthodoxe Russe St. Nicolas, and also the Phoenix Parc Floral de Nice, the city's main botanical gardens. More information about Nice Tourist Attractions. Many of the main tourist attractions around Nice are imposing landmarks in their own right, such as the 16th-century Fort du Mont Alban, which offers both impressive French military architecture and stunning views. Whilst not exactly historic, the Nice Acropolis dominates the area and is an eye-catching multimedia and conference centre. Also worth looking out for is the Old Port, a prominent reminder of its position as the French Riviera capital, being filled with swanky yachts and surrounded by a number of grand 18th-century buildings. More information about Nice Landmarks. Culture abounds in Nice and the city boasts a number of good museums and popular art galleries. Highlights include the Musée de Palaeontologie Humaine Terra Amata (Museum of Human Palaeontology), the Musée d'Archéologie de Nice-Cimiez (Archaeological Museum) and also the Musée Départemental des Arts Asiatiques (Regional Museum of the Asian Arts), all of which are filled with well displayed exhibits and educational information. For art lovers in Nice, the Musée des Beaux Arts (Museum of Fine Arts) can be found along the Avenue des Baumettes, while the Musée d'Art Moderne et d'Art Contemporain (MAMAC) along the Avenue St. Jean Baptiste is full of international modern paintings and pop art. More information about Nice Museums and Nice Art Galleries. The coastline of Nice is full of tourist attractions, although nearby are a number of appealing Côte d'Azur towns and cities. Also close to Nice are many traditional Provençal villages, which are full of character. For high fashion and history, Monaco is full of sightseeing opportunities and regularly frequented by movie stars and celebrities, as is the neighbouring resort town of Cannes, particularly in May, when its world-famous film festival is held. Best Price Guarantee - We always offer you our lowest available Corsica Ferries or SNCM passenger and car ferries ticket price to and from Nice. There are no hidden extras or surprises such as added fuel surcharges or booking fees and we also we do not charge you anything extra for paying with a Visa Electron card. The price we quote for your selected Nice ferry ticket, onboard accommodation and vehicle type is all you will pay, and that's a promise! In the unlikely event you find the same all inclusive Nice ferry ticket cheaper in the brochure of any other tour operator we promise that we will do our best to beat that price or offer you the choice of requesting a refund. To book Nice car and passenger ferry tickets please click here. At ferryto.com you are able to obtain live Nice ferry ticket prices, check availability and book car and passenger ferry tickets to and from Nice at our lowest available ticket price. Ferryto.com is part of the world's largest online ferry ticket distribution network providing the ability to book over 80 major European ferry operators including to Nice and to over 1,200 other ferry routes throughout the UK, France, Spain, Ireland, Holland, Eastern Europe, the Mediterranean, the Baltic and North Africa.